The missions up this way tend to be smaller and more fortress-like especially at Mission San Rafael and Mission San Francisco de Solano (in Sonoma), both of which were kind of afterthoughts. San Rafael was founded as a hospital mission to care for the natives who were dying in alarming numbers at San Francisco’s Mission Dolores. Sonoma’s mission was the only one founded after Mexico won independence from Spain. It was really just a colonizing addition to the existing military presence here and was established in response to Russian fur trading incursions on the Sonoma coast. While Mission San Carlos Borromeo (in Carmel) is lovely, it is still parish church sized. Santa Barbara and the ruins of the main church at San Juan Capistrano are cathedrals in size and opulence. Santa Barbara and Mission San Fernando are stuffed with 16th and 17th century artwork that also attest to the wealth of these missions. 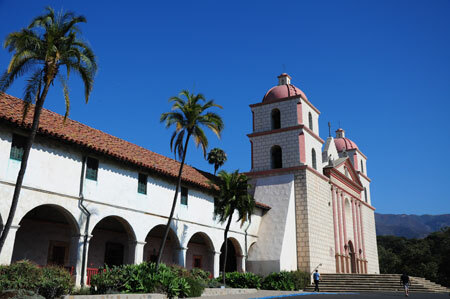 Mission Santa Barbara is rightly called The Queen of the Missions. It's huge and placed in a beautiful hillside setting. 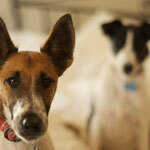 Both are isolated and set in acres and acres of their original grounds. La Purisma is, in fact, a state park with live samples of the breeds of livestock — pigs, turkeys, churro sheep, and long horn cattle — that would have originally been raised there. Especially, if you visit early and block your view of the parking lot, it’s easy to imagine the mission life of a padre or a neophyte. Missions San Antonio de Padua and La Purisma Concepción are so isolated and in much of their original grounds to give you an idea of a mission whose yearly tribute to Spain included such things as 1000 hides. Of course, that depends what you mean by integrated. 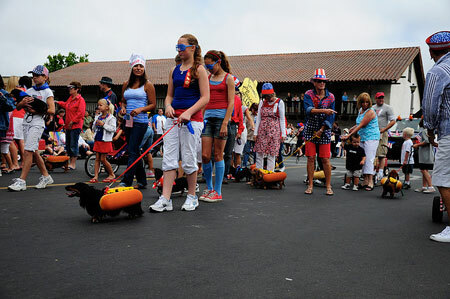 Sonoma’s Mission and San Luis Obispo are both smack in the center of their towns. And are the site of a full round of fund-raising and community events. But, although they still have services, I would call both more integrated in a secular way than religious as I think the bulk of the activity in both sites is secular. San Miguel, in the dusty little town of San Miguel in the Salinas Valley, at least judging by my visit, is the most active in the religious lives of its community. During my visit, there was a Quinceañera mass in Spanish, followed by an Anglo wedding, while out in the courtyard, the ladies auxiliary and the firefighters were setting up a fundraising barbecue. Brown robed Franciscan friars, who live in residence, were scurrying around organizing everything. I asked one of the gift shop ladies if I’d hit them at a busy time of year and she said this was a typical Saturday and not a particularly busy one. A lovely mission with one of the most commanding views, Santa Ynez is also plunked on the edge of a weird faux Danish town, complete with windmills, thatched roofs, and cutouts of Vikings. Maybe it was because I happened to hit town during their annual Danish Days, that this gem of a mission seemed neglected by residents who were more interested in pastry, smoked fish and Vikings on Motorbikes (don’t ask). 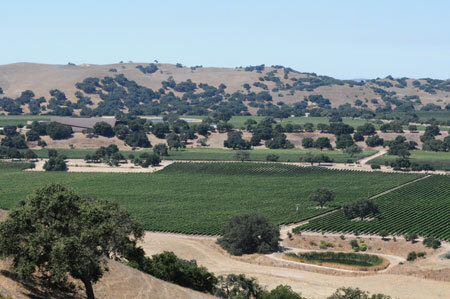 Or maybe, because the mission faces down an incredible view of vineyards, Santa Ynez is more concerned with the little communities in the Santa Ynez wine country than it is with wannabe Vikings. While I was there I saw at least 50 people and families receive free bags of groceries from the rectory. So clearly Santa Ynez is serving someone. And don’t take this criticism as reason not to visit. Santa Ynez is a lovely little mission and beautifully situated on a bluff overlooking picturesque vineyards and mountains. The view toward wine country from Mission Santa Ynez, which seems more concerned with this end of the valley than with the faux Danish town half a mile away. Little more than an adobe block house buffetted by the dusty Salinas Valley’s fierce and dusty winds, Soledad is a Padre Experience of a different kind. Especially if you visit it close to closing time, and you don’t have many agricultural vehicles driving by, you get grudging admiration for how intrepid the padres were in striking out for what would have been the wilds of places fairly unknown and living a hard existence in service of their faith. 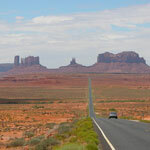 For this reason, I would not have missed this mission on my way to the grander sites. It puts the mission chain in context. Lonely little Mission Soledad (which means solitude in Spanish) is important to see as a counterpoint to the grander missions. Carmel mission is a gem and its flower garden is beautiful and extensive. But Capistrano takes it up a notch. 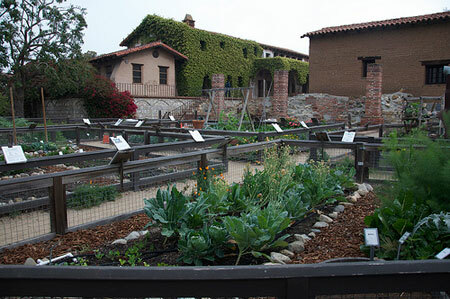 In addition to beautiful decorative gardens, it has recreated the original kitchen gardens that would have fed the padres and the Indians who lived at the mission. In fact, our new network of raised beds, which we’ve dubbed Flying Terrier Farms, were modeled in part after Capistrano’s kitchen gardens. Mission Santa Clara is now in the middle of the University of Santa Clara and acres of lawns, flower gardens and grapevine covered arbors. Not the least picturesque elements are the bright-eyed students of this Catholic University sprawling on the lawns with their laptops doing their homework. We admired the kitchen gardens at San Juan Capistrano so much, we modeled Flying Terrier Farms after them. While some of the wealthier missions such as Santa Barbara and San Fernando had centuries old religious artwork from Spain and Mexico, the most affecting artwork was that created by the neophytes attached to the missions. When I first arrived in California and started visiting missions, they were mostly whitewashed inside, which was the preferred method of restoration from the turn of the 20th Century on. But the original mission walls would have been brightly painted, mostly by the Native Americans attached to them. And they weren’t drawing the lives of the saints. Much of the artwork was decorative and showed motifs of native plants, fruits and animals. The best example, of course, is Mission San Miguel, which is the only mission to feature its original artwork, the creation of a Native American I’m calling the Michelangelo of the Salinas Valley and the studio of talented Native painters he trained. But I was pleased to see among artwork at many of the missions, paintings and representations of Our Lady of Guadalupe, Patron Saint of the Americas, and traditionally depicted with a dark complexion. Also more than one mission featured paintings of various saints and angels rendered as Native Americans. 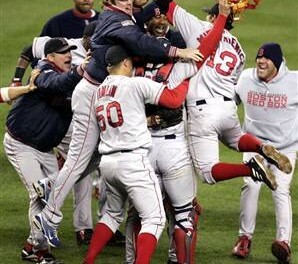 Which warmed me up a bit to the padres. Clearly they weren’t always trying to force a blond, European Christ down the throats of the Natives, but had some sense that God should be shown to represent all colors and ethnicities. 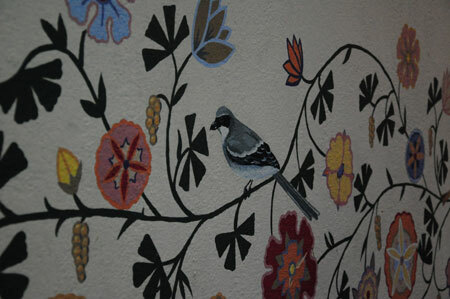 This recreated artwork at San Luis Obispo features native flowers, grapes and a Piñon Jay. The monks kept good records and the original artwork exists at Mission San Miguel, so this is probably a pretty accurate recreation. Every mission has this sort of sharp reminder of the human cost to native populations of the mission chain. Every mission, even the smallest and most heavily recreated, such as Santa Cruz, feature or at least have a marker to show the location of the graveyard for the Neophytes. The placques are heartbreaking. 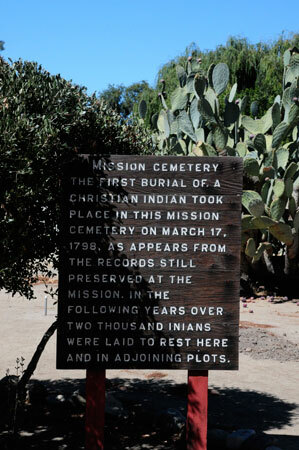 There is no mission I remember visiting that didn’t have at least several thousand Native Americans buried in unmarked graves. Since historians generally think there were no more than 350,000 Native Americans in California, even at the height of their numbers, to have several thousand buried in each of 21 locations roughly 20 to 30 miles apart attests to the terrible toll European disease took on California’s first citizens. Judging from comments I found on Yelp, TripAdvisor and other travel websites, this area used to be the mission graveyard or at least closely adjacent to it. 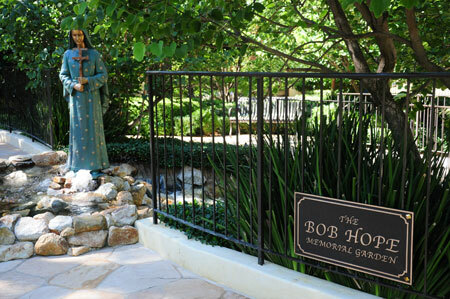 Now it is a kitschy memorial garden with burial plots for dead and someday-to-be-dead members of Bob Hope’s family. The comedian himself is buried under what looks like a Hobbit bandshell at the end of a path lined with tiny faux waterfalls and rose gardens. Everything from the thirsty non-native plants to the inartistic waterfalls felt like planting a cheesy roadside attraction on top of hallowed ground. If the Hope family gave a truckload of money for the restoration of the mission (which apparently was hard-hit by the Northridge earthquake), good for him. 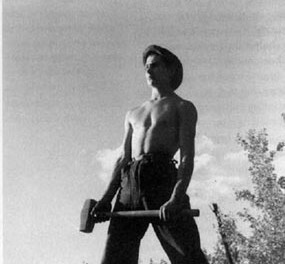 But the graveyard should have been left alone to honor those who gave their lives to build it and populate it. Or a better idea might have been to restore or plant gardens (with historically and environmentally sensitive plantings) to enhance the mission not enshrine a comedian. Shame on you, Bob Hope! But don’t put off visiting this mission because of this misstep. Mission San Fernando’s extensive grounds feature some of the most unique mission architecture including a lovely columned two story convent, a fruit orchard where California’s first pepper tree still grows, a church, which seats 1,000, and a six-acre enclosed central square that includes a sunken garden, elaborate stone terrace and octagonal mortuary chapel. This kitsch has no place at a mission, especially at a site where thousands of Native Americans are buried. The fake Carlotta Valdez grave is gone, but the Hitchcockian feeling lingers at Mission Dolores. Despite my aversion to Bob Hope’s stamp on San Fernando, I have no problem with entertainment types celebrating the missions. Anyone who has bitten their nails during the climactic scene in Vertigo where Jimmy Stewart chases Kim Novak up the mission bell tower, will recognize Mission San Juan Capistrano. Or maybe you won’t. The actual bell tower was a Hollywood set Hitchcock built on a back lot to service his scene. 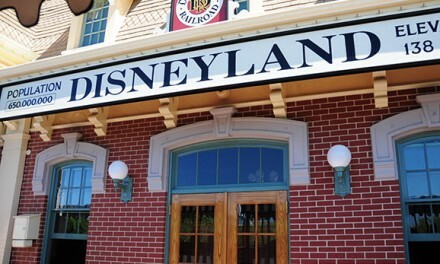 But the surrounding mission will…er…ring a bell. 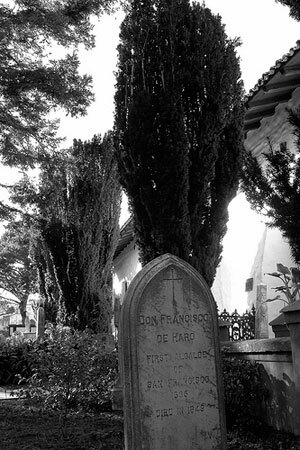 Mission Dolores — more specifically its graveyard — is the site of the scene in the same movie where Kim Novak, apparently in a trance and believing she’s the reincarnation of a Spanish lady of Old California, goes to stare at her own imagined grave. The fake Carlotta Valdez gravestone from the movie stayed in the mission graveyard for years until wiser heads decided it probably wasn’t appropriate. Extra Credit: If I haven’t mentioned a mission, it’s not because I didn’t deem it worth a visit. One thing that became clear, especially visiting several mission in a row, is that each mission builds on the understanding of the others in the chain. Even Mission Santa Cruz, which probably has absolutely nothing of its original left and only a third sized replica in its place, is worth a visit. After all, if you are down that way, you’ll be visiting Santa Cruz. Might as well stop in. Mission San Francisco de Solano, Sonoma: There is no one post for this one as so much of Sonoma’s town activities take place in, around and near the old Mission. Note to self: maybe this, as my hometown mission, does deserve its own post. Mission San Rafael Arcangel, San Rafael: Founded, in somewhat of an afterthought, as a hospital mission for the Indians who were sickening in great numbers in the fog of San Francisco. Sadly, I only included this visit in a compendium post. Note to self: deserves full post! Mission San Francisco de Asis, Mission Dolores, San Francisco: While I’ve been here many times on photographic missions, seems I’ve never done a full post on it. Put on to-do list! Mission San Jose, Fremont: A lovely little mission in the old part of town, the only one up north founded on the other side of San Francisco Bay. Find the post here. Mission Santa Clara de Asis, Santa Clara: The old mission is now in the middle of a beautifully manicured Catholic University. The extensive gardens and grounds, alone are worth the visit. 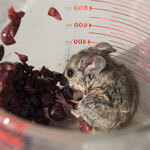 A record of my recent visit here. Mission la Exaltacion de la Santa Cruz, Santa Cruz: Sadly, there is so little here and what is is just a third-scale modern reproduction that, although I visited, I didn’t really write a post on it other than to mention it in passing. Mission San Juan Bautista: I’ve made several trips to this lovely old mission with its beautiful gardens and quadrangle, most recently accompanied by two fun 70 year olds on The Golden Girls Tour. The report here. San Carlos Borromeo de Carmelo, Carmel: Another lovely mission that I’ve visited many times but never written up. My report on my trip there with the Golden Girls was more concerned with the heartbreak they caused in Paso Robles than in the delight they found in the mission. Nuestra Señora de la Soledad, Soledad: Part of my most recent Mission Mission. The report here on this loneliest of missions. 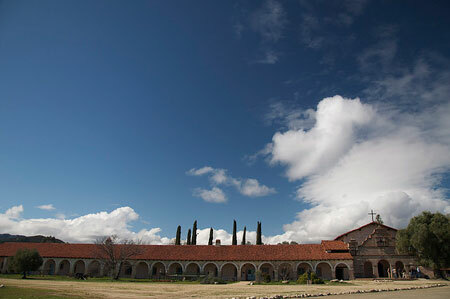 San Antonia de Padua, Jolon, 40 miles north of Paso Robles: I hit this beautiful mission, one of only a few situated in isolation from the modern world, on a pilgrimage to see the swallows return to San Juan Capistrano and visit the shrine of Buck Owens in Bakersfield. The report here. San Miguel Arcangel, San Miguel in the Salinas Valley: If you can only visit one mission — and I wouldn’t recommend that — I’d say this was the one. The only mission to include all its original native painted walls. Also, it’s a vital part of the dusty little Salinas Valley community. You’ll probably stumble on a wedding or Quinceañera or community event if you visit. The report here. San Luis Obispo de Tolosa, San Luis Obispo: I hit two missions this day so my report includes La Purisima as well. La Purisima Concepción, Lompoc: I hit two missions this day so my report includes San Luis Obispo as well. Mission Santa Ynez, Solvang: I visited this gem of a mission in the middle of Viking Days in the weird faux Danish town of Solvang. But if you can speed past the windmills, this is a lovely mission. The report here. Mission Santa Barbara, Santa Barbara: The closest mission I’ve seen to a European cathedral — other than the hints given by the ruins of the original mission at San Juan Capistrano. Definitely The Queen of Missions. My report here. Mission San Buenaventura, Ventura: This slightly sad little mission was once described by explorer George Vancouver as having the most extensive beautiful gardens he’d ever seen. Sadly, not much of the grounds remain, but the little mission is definitely worth a visit especially for the lovely native paintings on display including a San Gabriel painted as a Chumash Indian. My report here. Mission San Fernando Rey de España, Mission Hills, San Fernando Valley: A beautiful and architecturally significant expansive mission complex featuring an excellent museum, richly furnished rooms and a great museum. Too bad about the Bob Hope Memorial Garden that is a shocking travesty. 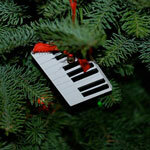 My report here. 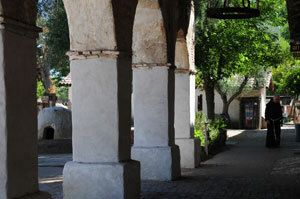 Mission San Juan Capistrano, San Juan Capistrano: One of my favorites of all missions. Visit it if you can on the festival of the swallows. I did and met a wonderful Chumash storyteller and performance artist who enhanced the native side of the mission. My report here. Mission San Diego de Alcala, San Diego: Seems I did this foray way back before I started this blog. No fear, I’ve got a San Diego trip planned next summer and will report in full. I am envious. Someday I will get to all of the missions. I would like to let your readers know that Mission Santa Inés is integrated in the local community, despite the architectural differences and the direction it faces. 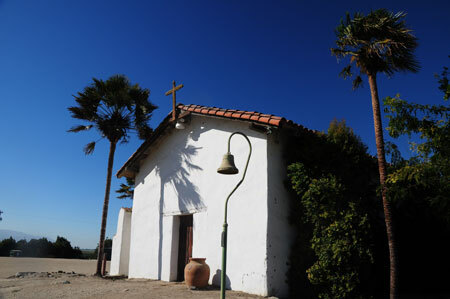 One of my personal favorites is La Purisima, which is the only mission that is a state historical park. Their Living History Days (check their website for dates) are amazing…they have blacksmiths, weavers, chandlers, soap makers, native games, cannons, and more. I thought Mission Santa Ynez was serving someone judging by the number of people who were receiving free bags of groceries. La Purisma is the only mission that is a State Historical Park. Except for Sonoma, which is too, along with the barracks, the Blue Wing in and the other historic buildings that comprise a good share of the Sonoma Plaza. I’m so embarassed to have repeated incorrect information! My apologies. That’s what they’ve always told us on field trips to La Purisima. that’s understandable. Sonoma is so small and such an afterthought, it’s almost like the “Forgotten Mission”. I enjoyed your Mission Mission very much. 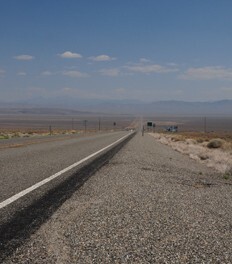 I’m going to have my own Mission Mission, sometime; twenty-six years in California and I’ve not visited one of them.